Thank you to all the kind words that I had received from so many of you in regard to the passing of my mother. I am also very pleased to see that my article "Tribute to Relationships" had such an impact on so many of you. Due to recent travels to be with my family during this time, I am going to share a very fitting article from Dr Chi that ties directly into my life right now as well as many of those reading this today. I look forward to getting back to my routines for all of our Depke Wellness followers next week. Enjoy this article packed with eye-opening information for you. Like in P.'s case above, stress can be a constant presence in today’s fast-paced environment. Dealing with bills, daily errands, or work deadlines can put our bodies in a continuous “fight or flight” mode, often with negative consequences to both physical and mental health. Chronic stress can cause fatigue, anxiety, the inability to concentrate, irritability, insomnia and depression. These psychological consequences can also have a larger impact, causing cardiovascular disease and even death. Slight psychological distress already increases risk of death from heart disease, cancer, suicide and accidents by 20%. Subclinical levels of depression or anxiety raise the risk of death from heart disease and stroke by 29%. Among individuals with severe anxiety and depression, the risk of death doubles. We are inundated with medications that are supposed to help people cope with stress, anxiety and depression. But the 400% increase in antidepressant use in the past 20 to 25 years suggests that maybe these drugs are not as effective as they purport to be. According to statistics from the Centers for Disease Control, 1 in 10 Americans over age 12 takes antidepressant and anti-anxiety medications. For these individuals dealing with chronic stress, anxiety and depression for years, there are more natural solutions. Chronic stress and depression often go hand in hand. The constant stress that the body experiences can lead to sustained high cortisol levels which, in turn, reduces serotonin and dopamine (neurotransmitters that regulate mood, energy, alertness, etc. ), eventually leading to depression. Both Chi Happiness and Relaxin have mechanisms that reduce constantly elevated cortisol levels and eventually lead to relieving stress and anxiety and alleviating depression. Chi Happiness contains herbs that naturally increase the neurotransmitters serotonin, dopamine and norepinephrine. These neurotransmitters are responsible for regulating moods, attention, alertness, compulsions and more. In depression and stress, the hypothalamus-pituitary-adrenal (HPA) axis is overactive. Chi Happiness regulates HPA activity, leading to reduced cortisol concentration. 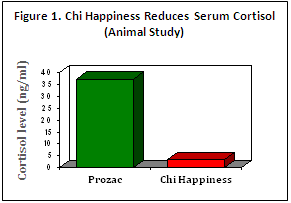 In one study, Chi Happiness was shown to reduce serum cortisol level in mice (Figure 1 above). Its reduction in cortisol was more than 90% lower than Prozac. Chi Happiness’ effect on cortisol levels was seen in a case report from Dr. G. Adams, MD from Florida. He has a 66-year-old male patient with abnormal levels of cortisol. As you can see in Table 1 below, his cortisol levels were constantly high throughout most of the day in July 2013. After 8 months on Chi Happiness and other supplements, his cortisol levels reduced. Chi Happiness has also helped a male patient in his 50s from New York who has been taking Prozac for years. He suffers from depression, paranoia and lack of confidence. Since he started taking Chi Happiness more than five years ago, his emotional health has vastly improved. He is now confident and not afraid to talk to people. He even manages a business and travels often. A similar effect was seen in a 37-year-old female from California who suffers from depression and had been taking Effexor for 3 years. Then she switched to Chi Happiness. She hasn’t used Effexor since. Combining Chi Happiness with Relaxin will produce a synergistic effect for individuals with depression. Relaxin has been effective in managing stress and anxiety, both triggers of depression. Furthermore, it also helps regulate the sleep cycle so it is helpful for insomnia, a common co-occurrence with depression. What makes Relaxin work is it enhances GABA (Gamma-aminobutyric acid) receptor activity. GABA is an inhibitory neurotransmitter with anti-anxiety, anti-stress and relaxing effects. It has a calming effect on aggressive behavior and helps curb fighting tendencies. Furthermore, it reduces anxiety. 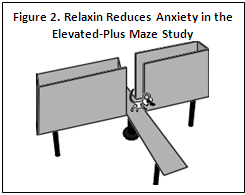 The elevated-plus maze study was conducted on mice to measure the effect Relaxin has on anxiety (Figure 2 above). In the figure below, anxious animals will obviously avoid the open platform. Mice given Relaxin, however, were found to approach the open platform more frequently and actually spend more time there, showing they had more confidence and less anxiety and stress. stress: Cortisol, Immunoglobulin A (IgA, and Chromogranin A (CgA). We now know that chronically elevated cortisol indicates stress. When IgA is low, it indicates delayed stress effect. CgA, on the other hand, is high in psychological stress. Monitoring these levels can give you a good idea if stress is being successfully managed. 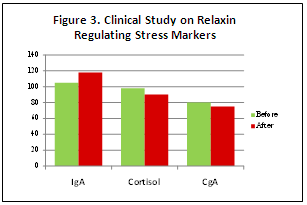 In one clinical study, Relaxin was able to increase IgA, reduce cortisol and reduce CgA levels (Figure 3). In a recent case report, Relaxin was shown to reduce cortisol level in a 60-year-old female from California with a thyroid tumor. After only 8 days of taking Relaxin, she reports sleeping so well it made her feel better overall. After a little over a month of taking Relaxin, her cortisol level normalized to 11.8 ug/dL. Besides reducing stress and anxiety, Relaxin also helps regulate the sleep cycle for longer and more restful sleep. In an animal study, Relaxin reduced the time to sleep while increasing the duration of sleep. In a clinical study, insomnia patients increased their sleeping habits by 100% while their daytime energy increased by 65%. EKG results show that brain waves during sleep after taking Relaxin are very calm. This means that Relaxin induces a deep and restful sleep, leading to more energy when waking up. Relaxin’s effect on sleep is evident in these cases. J. Wycoff, DO from Michigan, reports on two female patients with sleeping problems. One could hardly sleep straight at night. After taking 3 capsules of Relaxin, she was able to sleep 5 hours straight. The other patient took 2 capsules for one night and slept much better than before. J. Wright, MD from Washington, shares that a patient has been suffering from insomnia for years. After only 4 days on Relaxin, the patient has been able to sleep well and regularly. D.B., a 47-year-old male from California, had a chronic sleeping problem. Melatonin has not helped him significantly. It still took him about 1 ½ hours to sleep after taking it with a sleep duration of only 3 to 4 hours at a time. When he tried Relaxin, he had more favorable results. He was able to sleep easily only 30 minutes after taking it, with his sleep usually lasting 7 to 8 hours.